Overview of EQ it UP! While working as a therapist in a women’s prison program, I was faced with a lot of adversity. In just my first day, I was antagonized, criticized, and judged by an inmate and two of my coworkers. If not for my supervisor, I probably would have quit early on (instead of staying for 18 months). She dropped some gifts of advice on me throughout my term, including this, “Set your intentions and then stay on your path, regardless of what comes your way.” I did that, and it helped me to remember why I was there, rise above the chaos, and really support those who needed it. Write down the specific parts of your life where you want to set intentions. For an example, I will use my job at the prison. 4. FUNNEL IT DOWN MORE. I visualize my path to be made of soft, white sand. 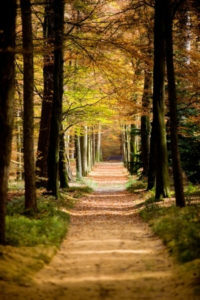 I am surrounded by plush green grass and tall trees lavished with colorful fall leaves. I can see mountains coming up over the trees. There are rays of sunlight shining through the trees lighting my path. I can feel perfect warmth on my skin, along with a light breeze. I can hear a gentle waterfall in the distance. My guardrail is made up of lavender scented, silk-covered beanbags, similar to my meditation pillow. On the ground before me, in the trees surrounding me, and etched in the mountains are the words “Hours, Compassion, Inmates, Healing” and “Breathe”. There are pieces of chocolate along my path, and the song “Eye of the Tiger” is playing. Play out the different scenarios that could unfold. If a “hurricane” (aka a bad situation) or a “tornado” (aka a bad person) tries to knock you off, what will you do to take care of yourself? Play out each potential scene, and visualize yourself breathing, repeating your mantra, and feeling grounded. Practice and Reinforce your mantra both reactively and proactively. Reactively: Each time you get pushed around that path, remember your intention. Take a deep inhale and on the exhale and say it out loud (repeat until you feel a shift). Proactively: Dedicate five breaths each morning and five breaths each night to reinforcing the intention. You can do these steps for any or all of the other items you wrote down in Step 1. And if you need some simple and effective ways to take care of yourself when you feel knocked or blocked from your path, please see my other post: “7 Ways to Cleanse Yourself Daily of Negative Energy Absorption (NEA).” Feel free to share your experience or ask any questions.